This might be a little counter-intuitive given the nature of the site, but what kind of blogger would I be if I only reported one side of the story? Okay, you got me; I’d be just like every other blogger out there. But, it’s time to face facts with the top five reasons NOT to start a blog. Time Consuming – The largest overall investment you will make for starting a blog is time. It can take hours to set one up and that doesn’t even begin to touch on the amount of time you will need to actually create content. Prepare to forgo any free time you may have had as blogging will easily fill in those voids. Little Returns – I’ve seen some of the best material yield only $2-$3 per week. If you’re entering into blogging for the sake of replacing your day job, I’d reconsider your stance. In your heyday, you’ll likely earn no more than a few dollars per day. Do the math and you’ll see it won’t do any more than partially supplement your income. You’re Not a Good Writer – A good blogger keeps his or her readers engaged in both current and future posts. No one will return to your blog if you can’t keep them wanting more. 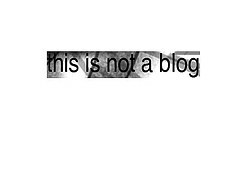 Don’t start a blog if you have any doubts about your writing ability. Your content will come from your mind meaning it will be only as good as you can make it. No Technical Knowledge – Maintaining a blog will require some technical background in HTML at the very least. If you plan on troubleshooting any problems yourself, you’ll need to know the basics in PHP and CSS at the very least. If any or all of these acronyms have gone over your head, maybe running a website isn’t for you. Now with that said, if you’re up for a good challenge and want to learn something new, I highly suggest you check out my ‘Start a Blog’ guide as it will teach you how to overcome everything listed above and it will set you on track to becoming a note-worthy blogger. You make some good points. Too many people just jump into blogging expecting it to be easy money, when it isn’t. Great points. It seems as if everyone does have a blog and everyone is part of some kind of social networking site. Some people blog because they just like to ramble – they like to talk to anyone that is listening. Making money isn’t what their after. By the way, great site and great blogging tips!